Before the epic snowstorm barreled into New York City like an out-of-control freight train, there was the reckless musical freight train of Skinny Lister. Performing last weekend at Roseland Ballroom in support of Flogging Molly’s Green 17 tour, Skinny Lister succeeding in doing what every opening act tries to do; they enlivened the crowd. Enlivened is too calm a word. Skinny Lister vivified the crowd. They galvanized the crowd. They downright shocked most of the crowd. As Lister’s set proceeded, more and more people found their way to the immense wooden floor, not because Flogging Molly was soon to be playing, but because the band on stage was embarking on the radical quest of taking the roof off the venue. Roseland Ballroom is a homey, multi-purpose venue in NYC’s Theatre District. It’s a spacious venue with a roomy dance floor and two elevated VIP areas (one main-floor, one mezzanine) that hang to the sides of the main dance floor. The Roseland consistently gives off the oversized wooden lodge feel, and sound is effectively reverberated. Not like that would be a problem for Skinny Lister. As you might have read in my initial review of Skinny Lister (Read Here), the band’s music is “bubbly and brainy, smart and sassy, powerful and…well…powerful!” When performing live, as I can now attest to, you need to quadruple the above praise, especially the powerful mention. 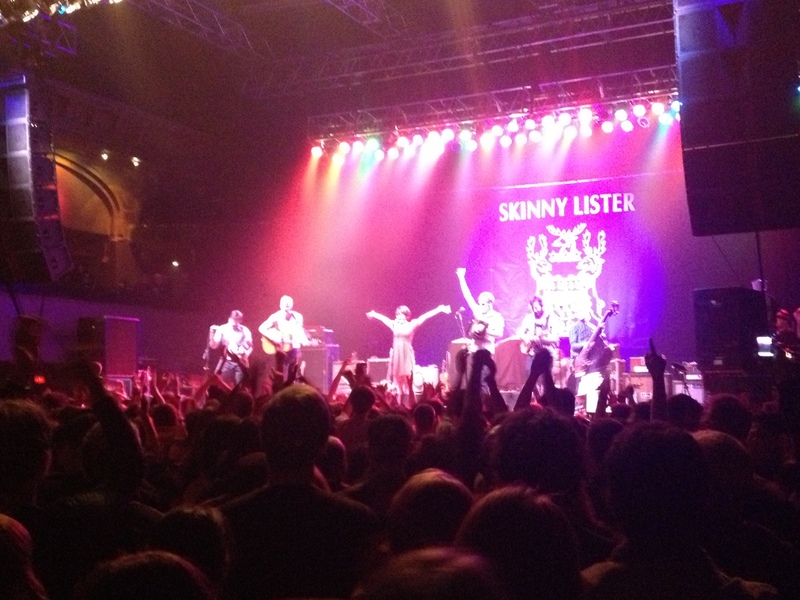 Skinny Lister packs a punch. The band combines classic English folk songs with a modern folk flare, and they do this with infectious ardor that draws crowds in. Halfway through the band’s set, the whole of the crowd was dancing jigs and shouting with the band in a communal alcohol-aided throb. It was truly a sight to see. Plus, in unprecedented fashion, the upright bassist did a stage dive and crowd surfed WITH his monstrous upright bass. The kicker was he didn’t stop playing. That’s the kind of show Skinny Lister put on. Energetic. Fun. Incredibly satisfying. It is no wonder why Skinny Lister has become masters of the road. More people should go out and see this exciting folk band. And, with news that they will be taking part in Coachella this year, it is safe to say more and more people are excited about this English band. Below are a few videos I shot at the show. Enjoy!